He is my "birding mentor." Science teacher, prairie restorer, canoeist, wildflower expert,former tennis opponent, birder and all around friend. 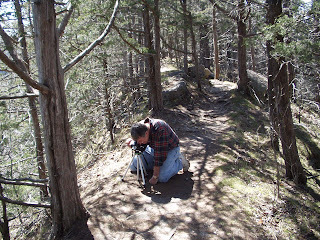 Here he is "capturing" the elusive pasque flower high on a ridge in Whitewater State Park. 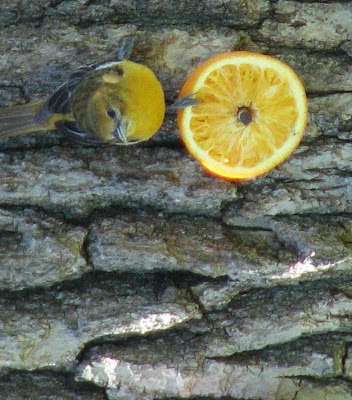 He singlehandedly brought me to a higher level of birding within the past year. It's not that I never identified birds before but it was entirely by chance. Living the outdoor life and being a trout fisherman meant there were always birds around me. Sometimes I noticed them, like the time son Tony and I were hiking a trail in the Bitteroot Mountains, up to a lake. We passed under a Ponderosa pine and noticed a large owl sitting above us. I knew it wasn't a Great Horned Owl, so when I got home and looked in my Peterson, it was identified as a Great Gray Owl, a bird I didn't even know existed. I usually saw tons of warblers along the stream but never bothered to identify the different types. So it went. activity. Gary volunteered to show me the birding ropes. 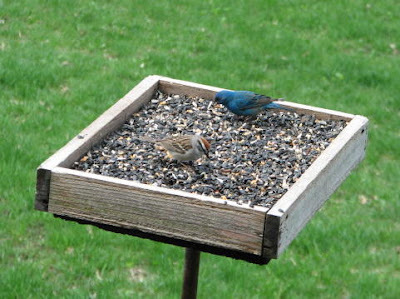 I joined the MOU and perused their daily listserv of bird sightings around the state. I joined ebird, so I would have a record keeping system to keep track of what, where, and when I made my own sightings. We began almost weekly outings throughout the fall, winter and this spring and he showed where and how to look. I finally became at least functional in the art, using my formerly dust covered binocs. The digital camera also came along. Then I began daily walks with my German Shepard, Baron, which proved to be another good opporunity to bird. Last fall there were many raptors and waterfowl to be identified. This winter I saw some real surprises. The first one was an Eastern Screech Owl WHO WHO began to roost in a wooduck box in the backyard. I, again had no idea that this was not a fairly common event until Gary rushed over with his camera to get some pictures. I took some pictures myself and sent them to MOU, which placed them on their websight under "rare sightings." I felt great about that. 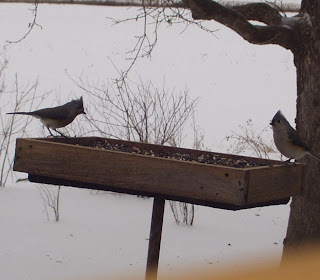 A few weeks later a pair of tufted titmice began to show up regularly. Not realizing that, while common out east, their range was limited to two southeastern Minnesota counties and rare at that, I sent in a report to both ebird and MOU. The result was an inundation of email's asking for my address. That also came as a shock. As we were leaving for Colorado and the holidays I consulted my better half and somewhat leery of strangers wanting to visit our property, she recommended the nonresponsive approach. Now, I wish the timeing had been different but that's life. It would have been fun to meet such avid birders! Spring was a whole different thing. Sparrows and warblers everywhere. Now I had to pay attention to eye rings and other markings to differentiate each species. What fun! By the time June had rolled around I had rack up 147 for my new "life list." This included birds, not only from Minnesota but from numerous states on the way to Colorado and back. Lately its been much more difficult to find anything new but then I'm doing the fly fishing thing now and I found wearing my good binoculars in the water is not too wise. That leaves out the small birds as I can't pick out any details. Ah well there is always next spring.